Many of us get our biggest work break at Christmas – and this is the time of year we tend to do a bit more driving than usual. There are all those extra shopping excursions, visits to relatives and trips to the beach to cool down. This extra time off also allows us the chance to indulge in an Aussie tradition: the epic summer road trip. Whether you’re heading up the coast, down the coast or inland to the bush, a long car journey requires a little more preparation. The last thing you need when you’re halfway to the Grampians or Whitsundays is to have your car break down because you neglected to give it a thorough check beforehand. There is a lot that can go wrong with a car through simple wear and tear that only a qualified mechanic can detect. There is a lot that can go wrong with a car through simple wear and tear that only a qualified mechanic can detect. Visit your mechanic at least 3 weeks before your planned Christmas trip so the car can be checked over completely. If you wait until the last minute, there may not be enough time before you leave to get any major problems fixed. And remember – a lot of mechanics like to take time off at Christmas too! Check fluids and top up as needed, including power steering fluid, windscreen washer fluid, engine oil, transmission fluid, brake fluid, radiator coolant, etc. Replacement of worn windscreen wiper blades if necessary. A check on your car battery for charge, corrosion, cable integrity and fluid top-up. Vehicle lights check – dashboard, turn signals, headlamps, high beams, hazard lights, etc. Tyre check for alignment, wear and correct inflation. Check condition of spare tyre. Check of the vehicle’s timing belt, spark plugs, hoses and connections. Check on the condition of springs, shock absorbers and struts. Brake pad check. Worn brake pads can be a real danger on longer journeys, especially in hilly terrain. Oil filter and air filter check. Australia’s various automobile associations offer all sorts of benefits to motorists, including travel discounts and 24-hour roadside assistance. If you’re not already a member, consider joining. Auto clubs can also organise tow trucks when you’re in an accident or your car won’t start. Give your vehicle a good clean – inside and out – before you head out on the big trip. A GPS system can be a real convenience. There are rules regarding placement and use of these systems, so make sure you do the right thing. Toting a GPS doesn’t mean you should leave all your maps at home, however – even the best electronic devices can occasionally fail for no discernible reason. Give your vehicle a good clean – inside and out – before you head out on the big trip. If you can’t bear to do it yourself (is it that dirty?) hire a professional car detailer to do the job for you. Make sure your license plate numbers are clean and clearly visible. Also, don’t leave any spare change in the car where it’s visible from the outside. Thieves are happy to break your windows to access free money – no matter how small the amount. Always double-check that your spare tyre is in good shape and your tyre jack and tyre iron are where they should be in your boot. And if you’re looking for a handy checklist for basic car maintenance, this article has some useful tips. A basic tool kit (wrenches, screwdrivers, spare bulbs, etc.). And don’t forget the WD-40 and duct tape! Seat belt cutter and window breaker (store in your glove box, not the boot). Have you ever heard the saying about packing for an overseas plane trip? You know, the one that goes: “Pack everything you’ll need and then leave a third of it at home”? It’s the same with packing your car for a Christmas road trip. 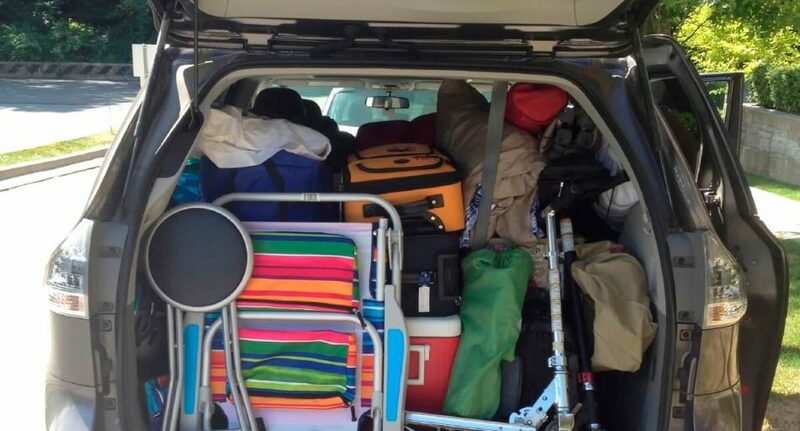 Don’t pack too much – this (a) leaves less room for the comfort of your passengers, (b) makes it harder to find things you’ve packed when you need them and (c) means unpacking takes longer when you finally get where you’re going. The less you pack the tidier and more organised your car will be. There’s also the serious matter of adding excessive weight to your vehicle. All cars have a recommended safe load limit, which you can find in your user manual. This is meant as a general guide and might say something like ‘5 passengers plus 68kg of luggage’. Whatever you decide to take on your road trip, make sure it’s all packed securely so it doesn’t shift around during the drive. Pets should always be in approved car restraints – not sitting on your lap. Distribute the weight load as evenly as you possibly can: the car will handle much better. When children are in the back seat, make sure they can access whatever they need without having to undo their seat belts to reach something. Alternatively, keep their snacks and other items up front and let them ask for them. Your personal checklist of must-bring road trip items will naturally depend on your destination and activities, the length of the trip and how many people are going. Camping trips tend to require more gear than journeys where you end up at a holiday unit or a relative’s house. Tents, sleeping bags, camping tables and chairs, cooking equipment and all the other extra stuff needed for a Christmas camping trip can take up a lot of room. It’s easy to pack way too much clothing for a road trip. A more sensible plan is to pack less and wash more. Even at a camping spot with an ablutions block, you can hand-wash clothes and dry them out as needed. If you’re staying at hotels, you should be able to leave things like linen, towels and even the hair dryer at home. Try to get by with a couple of pairs of shoes per person, suitable for your planned activities. The big luggage can go in the boot and passengers should each have their own small tote bag for items they’re likely to need while you’re on the highway. For adults, this might contain books, magazines, electronic devices and their chargers, maps, a destination guide and some in-transit snacks. Children should be given some choice in what they bring, including favourite toys and games, stuffed animals and/or security blanket and whatever will keep them safely occupied. You might want to provide each child with their own plastic container (with secure lid) for snacks. As every parent knows, children aren’t always perfectly behaved when it comes to sharing food in a communal situation! Make sure you have some kind of rubbish receptacle available so the car floor doesn’t end up looking like a trash heap. The problem with the use of electronic games in cars is that staring down at a screen for long periods sometimes leads to car sickness. One option that keeps kid’s heads facing straight ahead is a headrest mount that allows a tablet to be attached to the back of the seat in front so children can watch movies during the drive. If your trip involves a single hotel stop on the way to your final destination, pack a separate overnight bag with whatever you need for just that night. The little storage box in your central console is a convenient place to keep things like tissues, wet wipes and mobile phones. In the heat of summer, make sure everyone has their own water bottle. Just as the air conditioning in a plane can dehydrate you, so can the air con in a car. If you’re driving, try to keep the vent from blowing directly in your eyes – otherwise they’ll get sore and tired more quickly. All the items you don’t immediately need should be stored in your boot. If your trip involves a single hotel stop on the way to your final destination, pack a separate overnight bag with whatever you need for just that night. This will save you having to unpack everyone’s luggage for a quick one-night stay. If you are going away on Christmas, be sure to read our article called ‘How To Secure Your Home When Going Away For Christmas‘. You will be able to relax and enjoy your holiday better knowing your home is secure with a right home & contents insurance policy in place.